I’ve been in Toronto for the last week visiting some old friends. Most of these friends happen to be current or former humanities scholars so it was a rare time that I could talk about pop media without taking an hour to justify why it matters. So when we found the bottom of the third pitcher and the X-Men/Captain America round table reached a stalemate, S—— mentioned that she just completed the plot through to the end of Luca in her first playthrough of Final Fantasy X. Luca concludes in a memorable laughing scene which I will detail for those who haven’t seen it in the next paragraph. In the laughing scene, the protagonist Tidus, noted self-centred doofus (Alexander, Leigh. “Let’s revisit Final Fantasy X! Anyone?” Gamasutra. Jun 25 2014. ), learns that his father is (rather, appears to be) the central antagonist. He is, therefore, sad. The leading lady, Yuna, tells him that she copes with her own sadness by pretending to smile. Tidus pretends to smile, then he bursts out in an extended robotic laugh. Yuna joins him and together they churn out the same cringingly uncomfortable and phony laugh for a good minute. The two then seem happy. As S—— observed, it’s the most awkward scene anybody could ever imagine. But I did something I never thought I’d do: I defended the laughing scene. Tidus and Yuna are both the protagonist of the game, but only after the former hands narration to the latter (Scharr, Jill. “Final Fantasy X-Ray: It’s Stories All the Way Down.” Unwinnable. Dec 3 2012.). 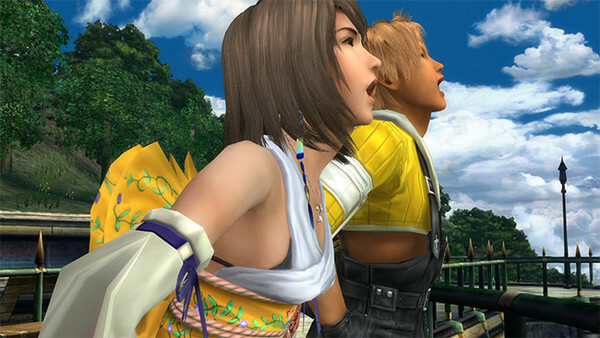 The plot of Final Fantasy X follows Tidus’s discovery of a new and frightening world that gradually teaches him to be empathetic; the plot simultaneously follows Yuna’s discovery of her own hopes and desires that gradually teaches her to resist the exploitative expectations of said frightening world. There are several parallels between the characters—the most obvious and significant is that both of their fathers are deeply respected and so they both grew up under extreme pressure to repeat their familial achievements—and they struggle with the same conflict: how does one reconcile individuality with duty? The difference is that they approach it from opposite sides, Tidus is a narcissist and Yuna is a doormat. When Tidus successfully reconciles his conflict, the game shifts focus to Yuna as she reconciles her own, but for most of the game they’re on either side of that line trying to figure out why they can’t reach one another. The laughing scene at the close of Luca shows Tidus and Yuna trying to relate to one another. Tidus wants to commit to Yuna’s pilgrimage but he’s too busy sulking about his homesickness and family trauma just as Yuna wants her own life but she can’t abandon her responsibilities as summoner. Yuna pretends to be happy because she doesn’t want to worry anybody else. In the laughing scene, Yuna shows Tidus how she sacrifices her self for others and Tidus gets over himself for the party’s cause: it’s the first time they really relate to one another. It’s clumsy and uncomfortable but the player isn’t a part of the cutscene, they don’t have control of either character. The player can’t relate to them and they aren’t supposed to relate to them. The player is watching a private moment between two people who’ve never known privacy; they’re watching two sad people flatly lie to the world about their feelings. Of course it’s going to be awkward. It’s effective because the player is on the outside of an awkwardly intimate moment between two people wrestling with the same problem early on in their relationship. The two leads get better at communicating and eventually help one another resolve their conflicts, but early on they don’t know what they’re doing and that’s reflected in the discomfort of the laughing scene. So there. That’s it. That’s my reading of the laughing scene. Waddya think? I explained my reading to S—— and the rest of the table in that bar in Toronto. It doesn’t make the scene any more enjoyable as an audience member, but I do believe it’s aesthetically effective at reaching the game’s thesis and communicating its theme. A—, a bigger sucker for Final Fantasy than even me, rolled his index finger around the rim of his glass and said “I think you’re giving the game too much credit.” That might be the case, but I don’t really care because I’m more interested in effects than intention. If you’ll indulge me another anecdote: some time ago, I wrote about how Final Fantasy Tactics (I really am a one-trick pony, aren’t I?) treats the idea of religion as a complicated but empowering part of the characters’ lives (Filipowich, Mark. “The Complexity of Faith in Final Fantasy Tactics.” Game Church. Aug 2 2013.). Afterwards, Zachery Oliver at Theology Gaming took issue with my argument (“On Accuracy and Final Fantasy Tactics. Part 1. Part 2. Aug 6; Aug 8 2013.). A good deal of his own essays involved director/writer Yasumi Matsuno’s documented personal beliefs along with a larger body of work in the genre. Looking at Japanese media, JRPGs, and Matsuno’s writings and interviews, Oliver argues that FFT is about the manipulative influences of organized religion; religion is not, as I argue, complex at all and it certainly isn’t empowering. He makes a strong case and I think he’s standing on solid ground, but I don’t think he shuts down what I was saying because I was using a different body of evidence. In my Game Church piece I chose not to base my writing on Matsuno or any other game. I chose to stay more or less within FFT‘s text and under that condition I think my interpretation of the game is valid. Matsuno might have intended to vilify organized religion but the finished text (I’ll be using text to broadly refer to “published thing.” It can be a novel or it can be bathroom graffiti), but I’m not interested in his intentions. I took something from it and I tried to elucidate how it effected me and why. I think my argument still stands, just as I think that Oliver’s arguments stand. We’re all just engaging with different materials to draw different meaning out of Final Fantasy Tactics. There’s room enough for both of us to be right and the fact that FFT can sustain different interpretations is a mark of its quality. Engagement with media/art/things in the world is a process of communication: human beings—consciously and not—interpret and make connections with the things they encounter (Rosch, Eleanor. “Principles of Categorization.” Cognition and categorization. Ed. Eleanor Rosch and Barbara B. Lloyd. Hillsdale, NJ: Lawrence Erlbaum, 1978. 27-48.). The artist speaks, but not just on behalf of themselves; they speak on behalf of their subjects and audience as well. When you come in contact with a text you—directly or indirectly—interpret its language and tease meaning out of it. The author’s meaning, your own, your family’s, your community’s, your culture’s, your time’s all have a role in interpreting the text. The author is privileged as the person that put it there, but they can’t possibly hope to contain the different possible ways that it could ever be interpreted. The text might say things the author does not intend, or the author’s intentions might not be as interesting or valuable as what others take from it incidentally. This is a pretty basic but important foundation for a lot of literary theory that developed in the last century and I think that it’s worth bearing in mind. However, none of this is to say that an author can’t intentionally place connections in their work with the intention that a reader will then make those connections. An author might guide the reader to certain interpretations or form a line of logic that leads to a specific argument. We might call a person who crafts their work toward an intended interpretation a good artist. But I don’t want to make a value judgment because that’s another can of worms inside the current can of worms. A matryoshka doll of worms…ew. The reason I’m saying all this (other than meandering kind of being my thing) is because the role of the critic is usually not obvious. Critics are poised in contrast to the author and to the audience, usually understood (interpreted, really) as an institution that brings people down (Ebert, Roger. “‘Critic’ is a four letter word.” Robert Ebert’s Journal. Sep 18 2008.). All that art is (let’s get this over with) is a bunch of language. Why it’s there doesn’t matter (at least not to me and not right now). The audience will take whatever they will from that language. The critic tries to dissect the language further and compose arguments out of what a text makes them feel and see. There is no ultimate, correct interpretation, just connections to ideas to serve as further connections. This is important because art informs culture, culture informs people and people effect one another. The critic pursues deeper connections and argues their validity because people accept whatever reality they’ve connected together on their own. There are tenuous connections and poor arguments, and critics may give creators more credit than they deserve (especially in videogames, let’s be realistic) and there are going to be shallow critics and abstruse critics. That’s fine, you probably aren’t trouble until you find yourself agreeing with everything anyway. There’s a sense that criticism is about inventing connections—which, in a vague way, it is—but the key skill is the ability to argue those connections so that others can see them more clearly without hyperbole, deception or manipulation (Teti, John. “Those Games Mean Nothing to Me.” Crispy Gamer. Sep 10 2009.). I realize this is a difficult craft to justify in a capitalist setting because it’s applications are less obviously practical than plumbing or repossessing homes. Like all uses of language, critical thinking is a necessarily political act that depends on individuality. Not the kind of individualism bragged about in western social sciences—I don’t actually think western countries value the individual at all, they just value certain kinds of individuals according to patriarchical standards—but the kind of individual developed by their circumstances. I believe that people are more similar than different, but there are certain experiences that I, for instance, just can’t ever understand. Even those experiences I’m able to abstractly relate to I can never justly speak on behalf of. The problem with the exclusive hiring of able, white, cis, heterosexual middle-class men in their thirties at the shrinking number of reputable and/or mainstream outlets isn’t that those people don’t have anything valuable to say, it’s that it dismisses the realities of all others. Marginalized people have a different perspective they can bring into their interpretations of a text and everybody stands to benefit from unique perspectives. Homogenizing creation and criticism in an already institutionally racist and sexist culture is poisonous. Especially in an occupation that only rarely provides materials required to live. I want to end this with a quote from philosopher Giles Deleuze: “It is strange that it was Proust, an author thought to be a pure intellectual, who said it so clearly: treat my book as a pair of glasses directed to the outside; if they don’t suit you, find another pair; I leave it to you to find your own instrument…” (Foucault, Michel. “Intellectuals and power: A conversation between Michel Foucault and Gilles Deleuze.” Language, Counter-Memory, Practice: selected essays and interviews by Michel Foucault. Ed. David F. Bouchard. New York: Cornell UP, 1980. Posted by Joseph Kay in lib.org.). Art and media and language are all a means of accessing the world. A critic just tries to make draw connections to better understand what a text says. On some level criticism is intuitive, which is something worth encouraging. Even if it does mean putting up with awkward laughing every once in a while. Further reading: Swain, Eric. “The Reader’s Manifesto and why it could be A Gamer’s Manifesto.” The Game Critique. Apr 14 2011. Ligman, Kris. “The Points Don’t Matter— Wait, Yes They Do— Wait, No— ” Dire Critic. Apr 14 2011. Gursoy, Ayse. “Game Worlds: A Study of Video Game Criticism.” Diss. Princeton. 2013. Brice, Mattie. “Games criticism as a selfie.” Critical Proximity. San Francisco. Moscone Center. Mar 16 2014. Keogh, Brendan. “On video game criticism.” Overland. 214. 2014. Rhodes, L. “The Critic.” Interview with Jenn Frank. The Ludorennaissance. Culture Ramp. Sep 2012. Mendelsohn, Daniel. “A Critic’s Manifesto: The Intersection of Expertise and Taste.” The New Yorker. Aug 28 2012. I played FFX for the first time a couple years back, i was late to the party. My reading of the laughing scene, first time through, was basically a less sophisticated version of your reading. Is it awkwards? Sure, but I loved it and it stuck with me. I’ve got no real deeper insight, but I think yours is a fairly straightforward reading of the scene.